Wow, it’s February and we’re just posting about Christmas dinner! These last few months have been busy but it’s time to catch up a bit with this blog. Before Christmas I saw that Isa posted her recipe for Sweet & Smoky Glazed Tofu Ham from The Superfun Times Vegan Holiday Cookbook. We decided to make it for Christmas dinner and it was fabulous. On the side we had roasted brussels sprouts, whipped sweet potatoes and bananas and cranberry sauce. 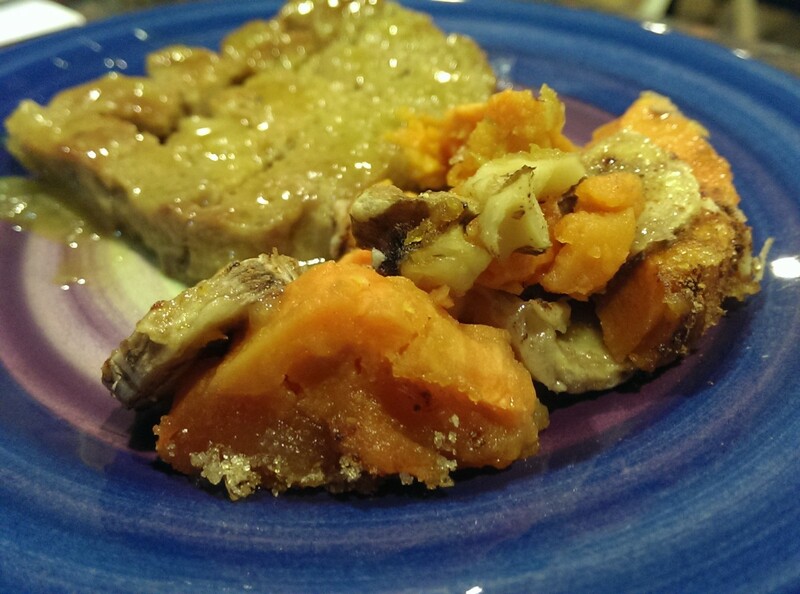 The sweet potato recipe was something from Tyler Florence that we did for Thanksgiving long ago and enjoyed. The recipe calls for honey and butter but it’s easily veganized by using agave and Earth Balance. This time we cut way back on both the sweetener and the fat and it was still great. On another note, we didn’t accomplish our goal of using 52 different cookbooks last year but we decided to keep plowing ahead to see if we can get through all 52 by the end of this year. We’ve since purchased the new Isa book and it’s added to our list (we also made the Cheeseburger Pizza for the Super Bowl and it was awesome) and we have a couple others to add. Another book we’ve added to our collection was just released recently – Kathy Hester’s The Ultimate Vegan Cookbook for Your Instant Pot. We love our Instant Pot and this book has been a good addition to our ever growing cookbook shelf. So far we’ve made the Jambalaya (pictured below), which was quick, easy and tasty, and also the Southern Breakfast, which is grits and a tofu scramble made in the Instant Pot at the same time. We decided we like a tofu scramble made on the stovetop better but the grits were awesome. Despite living in the South we don’t eat grits often but this recipe will change that. We’ve already made grits multiple times since then. Now step into the way, way back machine for another cookbook we just added to the list. The Horn of the Moon Cookbook was one of the first vegetarian cookbooks we ever bought (there were quite literally only about two vegan cookbooks available at that time) and we don’t use it much anymore because it’s fairly egg and dairy heavy but the Cashew French Toast recipe (pictured below) is one we keep coming back to. It was especially good now that we have a Vitamix because the batter whipped up super creamy. If you’ve read this far, congratulations! Here’s a bonus recipe: mix 1 1/2 cups non-dairy milk with 1/2 cup cashews, 2 Tbs. sunflower seeds, 2 Tbs. sesame seeds and 1/4 tsp. vanilla extract in a blender or food processor. Pour over some thick slices of bread and cook like you would French toast. Combine all the ingredients in a non-reactive pan and bring to a boil over medium-high heat. Reduce heat to low, cover and simmer, stirring occasionally for about 20 minutes or until most of the cranberries have popped. To those of you who celebrate Christmas, we hope it was a good one. We thought we’d share our Christmas menu to give you some ideas for future holidays. 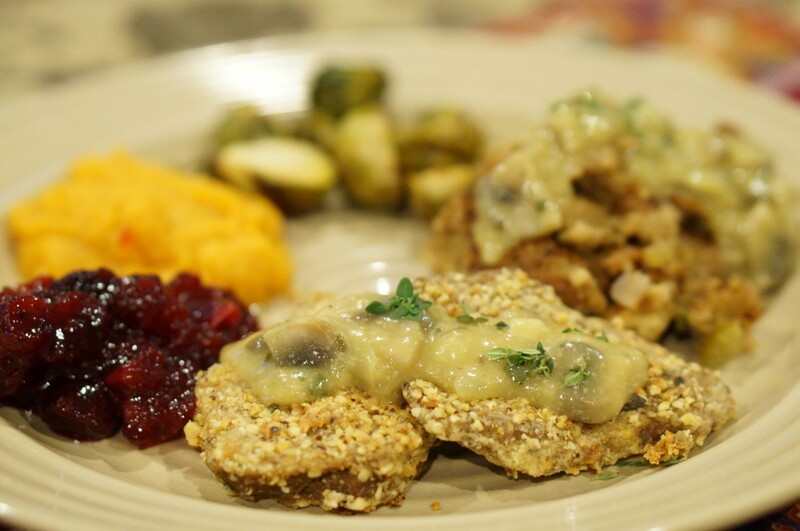 Speaking of ideas for the holidays, Alicia Simpson’s Vegan Celebrations is a good place to start and that’s where we found the Hazelnut Crusted Seitan recipe. It’s essentially just pan fried seitan with ground hazelnuts in the breading. And it was delicious. The newest cookbook in our collection is the Oh She Glows Cookbook and it was there we found the mushroom gravy and apple crumble recipes. We’re really looking forward to diving more into this book. For the stuffing, I usually make it up as I go but I should write down a formal recipe because it’s so good! The general process is described in our first ever Thanksgiving post. The sweet potatoes were just baked whole then whipped in a food processor with some Earth Balance, while the brussels sprouts were roasted with a little salt and olive oil. Fresh cranberry sauce can’t even be remotely compared to what comes in a can and most of the time if you buy a bag of fresh cranberries there’s an acceptable recipe right on the bag. We’ve used other cranberry sauce recipes in the past but this year we used the recipe we found on the bag and it came out great. 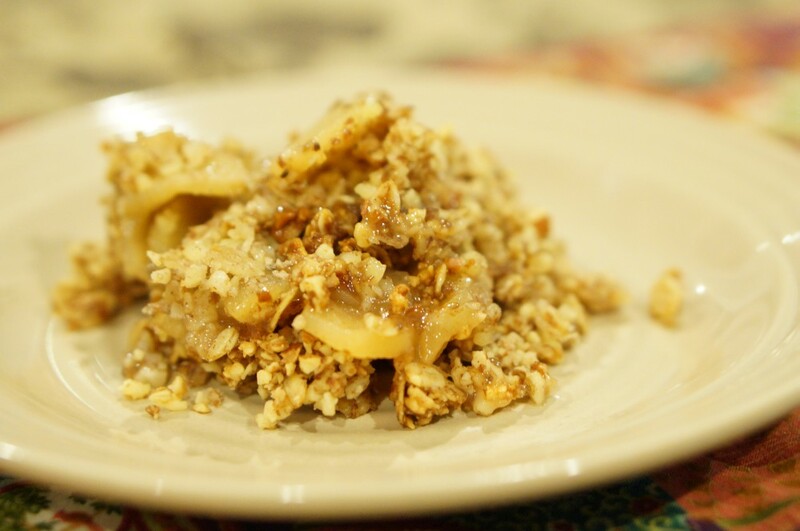 Finally, Angela’s “Mother Nature’s Apple Crumble” recipe is re-posted here. The main adjustment we made was using whole almonds that we finely chopped in the food processor because we didn’t have sliced almonds. I think I actually prefer it that way. We hope everyone is having a great holiday season! Thanks in large part to Darlene (aka Super Mom) we had a fabulous Christmas dinner yesterday. We spent a good bit more time cooking than we usually do but we made a lot of food. 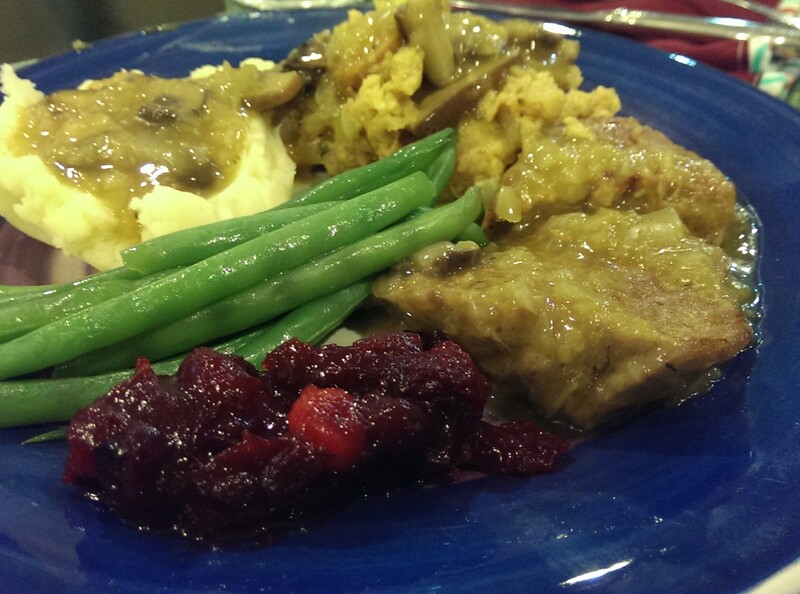 And the nice thing about that is we didn’t cook dinner tonight – there were plenty of leftovers. The main course was a simplified version of the Smothered Seitan with Mixed Mushroom Gravy from Bryant Terry’s Vegan Soul Kitchen. To go with that scrumptious creation we also made apple-sage stuffing, mashed potatoes, steamed green beans, cranberry sauce and roasted sweet potatoes with bananas. There was so much food the sweet potatoes didn’t make it onto the plate and since we didn’t make anything for dessert they filled in quite nicely in place of dessert. The kid loved them too (and he also requested extra seitan). Everything was totally from scratch save for the store-bought bread we used for the stuffing and packaged vegetable broth for both the stuffing and gravy. Both of those items we would’ve liked to make from scratch (and do make from scratch regularly) but time was a little short. The nice thing about having leftovers for dinner tonight was that we had time to make a proper dessert. 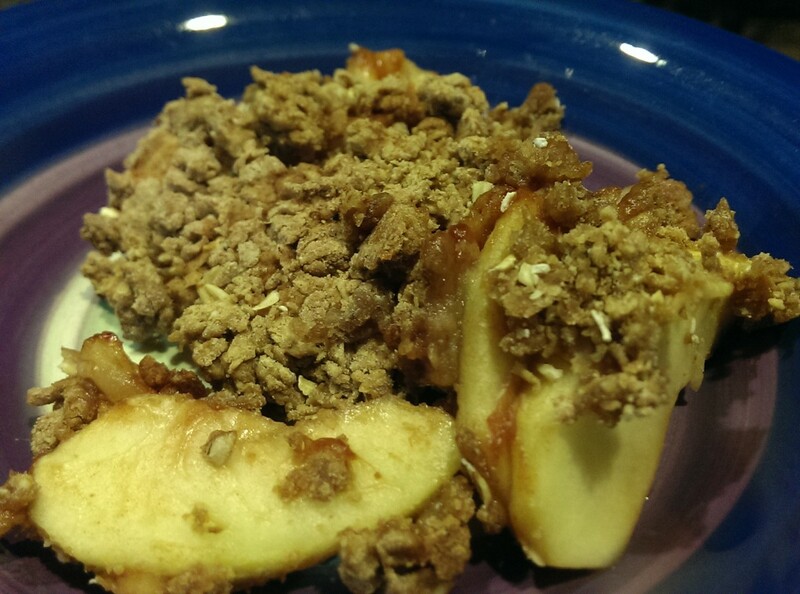 Darlene used the Apple-Ginger pie recipe from Vegan with a Vengeance and turned it into more of an apple crisp. Yum! ‘Tis the season. 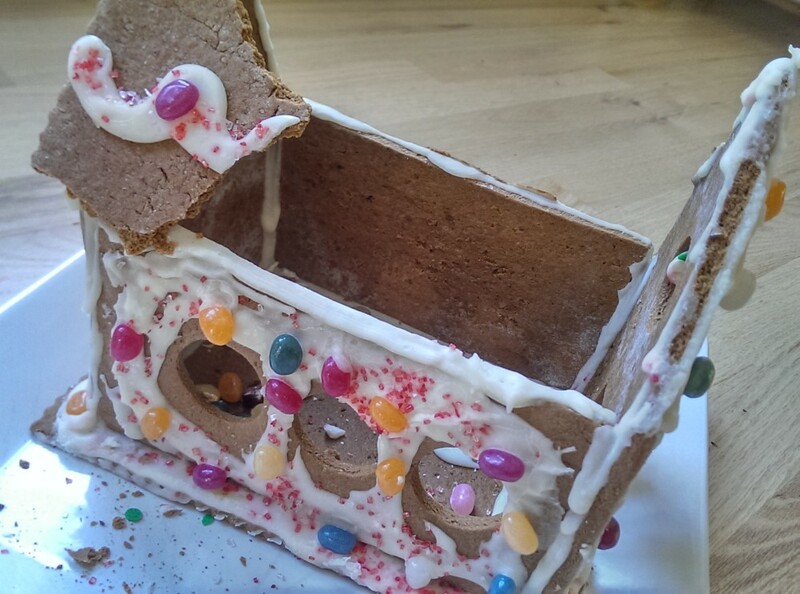 We’ve actually never made a gingerbread house before but Darlene thought it would be a fun activity for the 5-year-old. She happened upon some gingerbread house kits in a store but most of them weren’t vegan. There was one that appeared to be vegan but it had a list of ingredients a mile long, including all manner of preservatives and artificial flavors. So she smartly put that box down and ran the other direction. All the way home. Where she promptly found a simple gingerbread house pattern on-line and set to work making the frame using the Gingerbread Cut-Out Cookies recipe in Vegan Cookies Invade Your Cookie Jar. 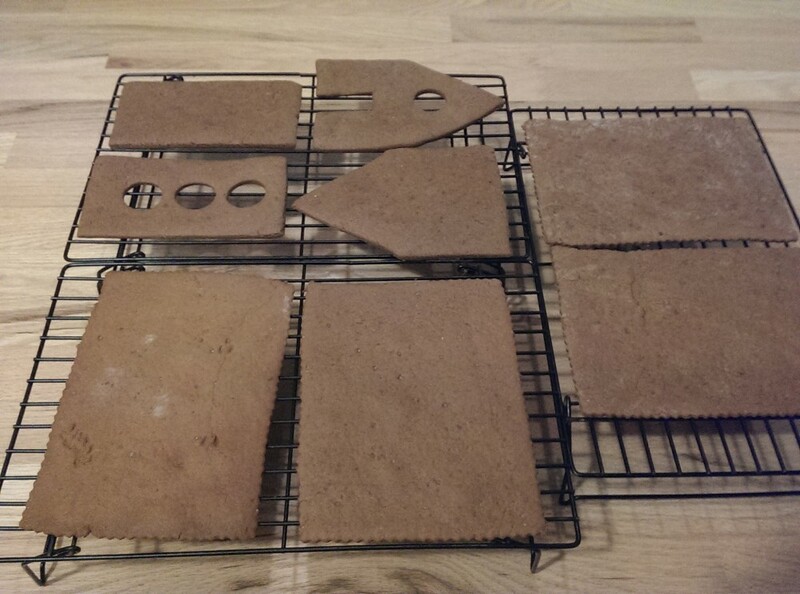 These were baked a couple minutes longer to ensure they were sturdy enough to build a house from. She and the 5-year-old then set to work building and decorating the house. The “glue” was a vegan royal icing recipe that she modified slightly (mainly using brown rice syrup instead of corn syrup). The result was a one-of-a-kind creation that’s not chock-full of chemicals. And yeah, it tastes pretty good too. Nibble, nibble like a mouse. 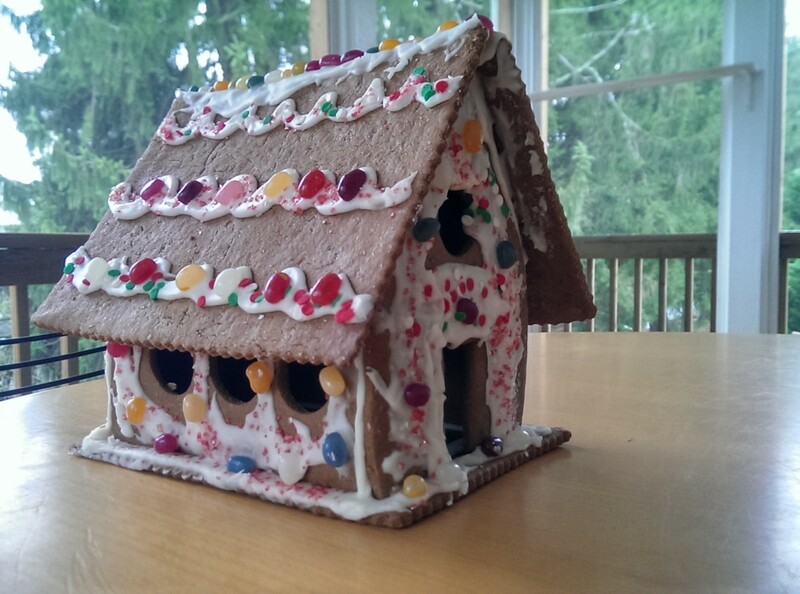 Who’s that nibbling on my house?